Petra Kvitova has won two Wimbledon Grand Slam singles titles so far in her career and she is arguably the best left-handed woman player in the game today. For tennis fans, here are some great photos of Petra Kvitova in 2018. 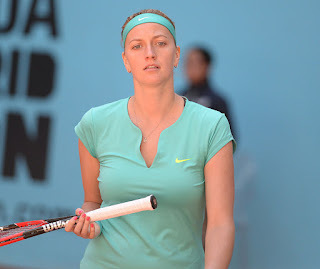 Petra Kvitova was born on March 8, 1990, in Bilovec, Czech Republic. Petra won her first Grand Slam singles title at Wimbledon in 2011. Petra won her second Wimbledon singles title in 2014. At the other Grand Slam tennis events, Petra Kvitova has reached the semifinals at the Australian Open and the French Open and the quarterfinals at the U.S. Open. Petra Kvitova has won 23 WTA singles titles so far in her great career. So far in her career, Petra Kvitova has already earned over $25 million in prize money. Women tennis players can make great money these days if they are good. Watch for pretty Petra Kvitova at the 2018 U.S. Open this year in New York City.